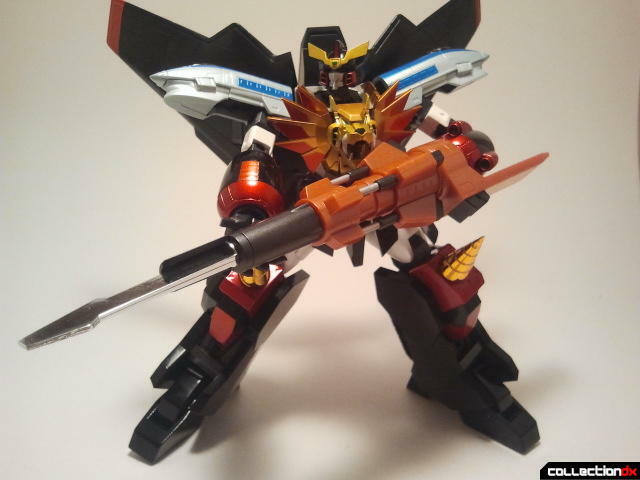 GaoGaiGar was provided by our comrades in bravery and courage, HobbyLink Japan. 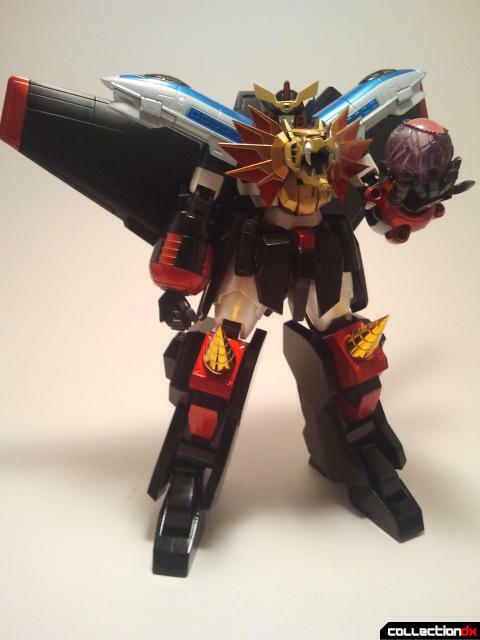 Get your GaoGaiGar there! Several pictures provided by the excellent ArshadAA. Thank you good sir! 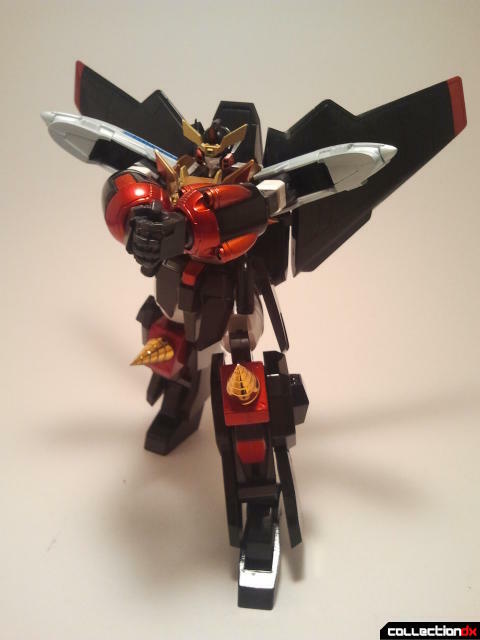 GaoGaiGar is one of those iconic super robot designs that just stands out among the sea of giant robot shows that have come out over the years. Unfortunately, despite being a fantastic robot that is literally designed to be had in toy form, its ambitious mechanical design has made it difficult to get a GaoGaiGar toy that does it all. 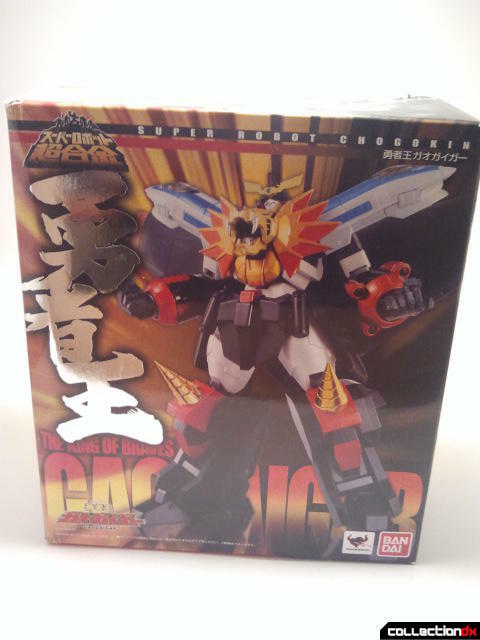 With Bandai's recent Super Robot Chogokin version of GaoGaiGar, another toy of the King of Braves has arrived, although it does not transform into the separate components of GoaGaiGar. How does it hold up on its own though despite that? Let's find out. 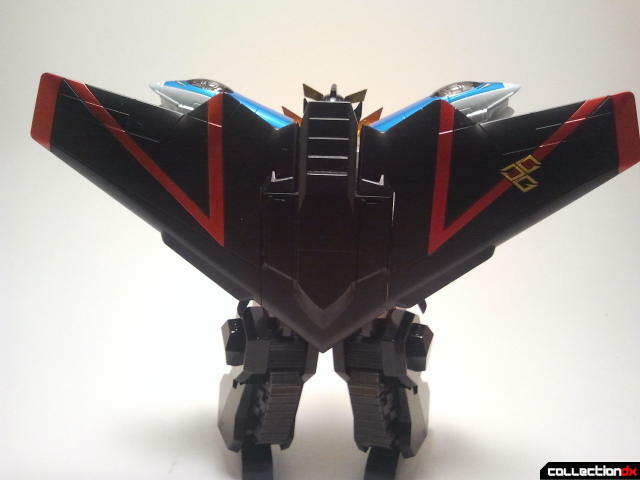 GaoGaiGar comes in the standard Super Robot Chogokin packaging. There's no clear window, but in its place is some nice big shiny Japanese characters which I don't understand at all. It sure does look cool though. Out of the package GaoGaiGar is quite large and hefty for a Super Robot Chogokin. The diecast content is located mostly in his super glossy legs and feet. The smartly located diecast really helps him maintain a pose despite his heft and unwieldiness. 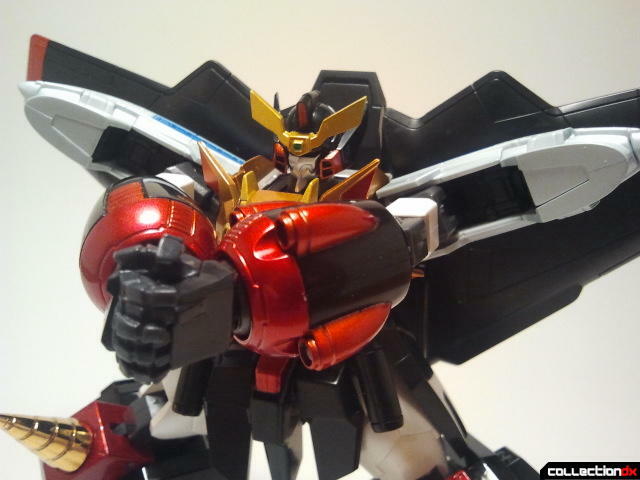 The sculpt and detail on GaoGaiGar is fantastic. The paint is super glossy and shiny, and the metallic hues behind it reflect brilliantly under the light. The Liner Gao's train windows and doors are all sculpted in, which really adds an extra layer of depth to the design. The drills on the Drill Gao are even done in golden chrome, and they rotate freely too! The Stealth Gao is done in a much more matte black plastic which seems to be an absolute finger print magnet. It doesn't matter how clean your hands are, this plastic will seek out any oils and residues that are hiding in the crevices of your fingerprints and smear them all over the Stealth Gao. It's annoying, but nothing that a tissue won't fix. Plus the Stealth Gao's wings can move too! Articulation is an area where GaoGaiGar has always had a bit of trouble. The cumbersome design has left us with figures that are top heavy, unposable, and unsatisfactory. 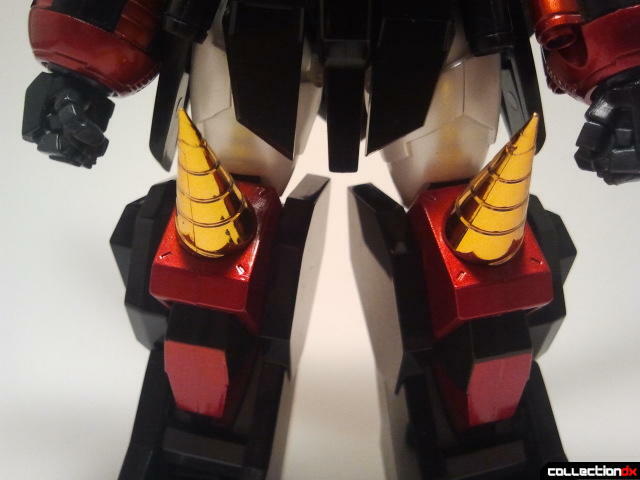 The Super Robot Chogokin marks the first time where I think a GaoGaiGar has almost too much articulation. Let's start off with the basics. The legs are feature ball jointed hips, thigh swivels, double jointed knees and ankles, along with some superfluous toe articulation. The hips may seem limited, but the hip joint can actually pull down much like an S.H. Figuarts joint and offers a much wider range of motion. The ankle tilts are slightly limited, but by the virtue of the blocky design, it's nothing I can really complain about. One of the neat features of this toy is that the knees are jointed in tandem with the Drill Gao, so the upper knee moves on an additional joint. It looks really cool in motion. The torso's balljoint has a fantastic amount of reach in all directions. 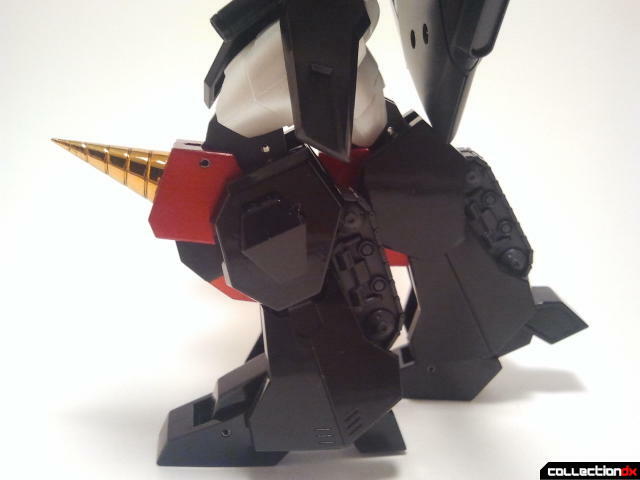 It reminds me of how crazy a Revoltech's midsection can get. Galeon's mouth can also open and close if you are inclined to do so. The head is also double ball jointed and very emotive. The arms are where things get a little crazy. There are no less than EIGHT joints in each arm: a swivel post for the shoulder, ball jointed shoulders, shoulder swivels located under the Gao Liner, bicep swivels, double jointed elbows, a forearm swivel, an additional cut for the forearms to go even further up, and then ball jointed wrists on top of all of that. The articulation is fantastic, if a little overkill. 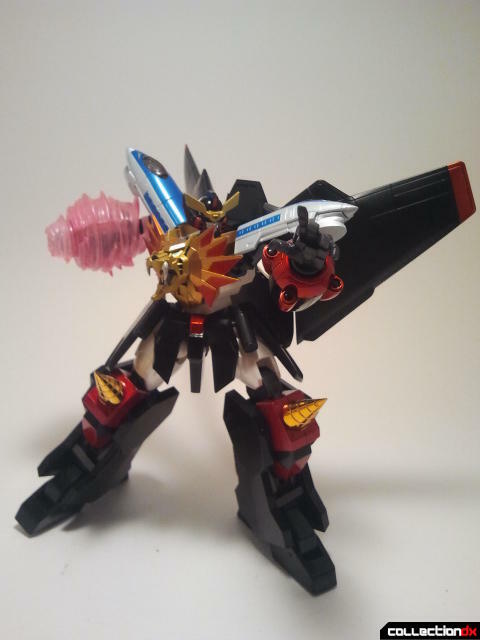 Some times it's a little bit fiddly getting GaoGaiGar to do just what you want him to with his arms. 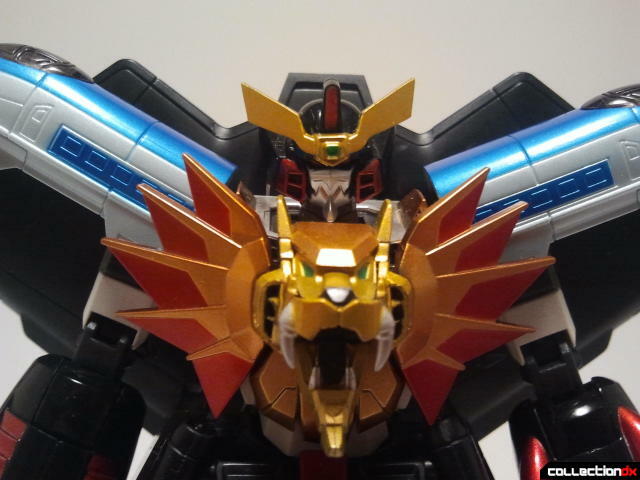 GaoGaiGar comes loaded with accessories. The only two other Super Robot Chogokins I own are the Alteisen and Mazinger Z, which are both relatively self-contained. GaoGaiGar is nothing like that. He comes with seven extra hands, an alternate face, two effect parts, and the Dividing Driver as well (And that's not including a whole whack of optional parts included!). 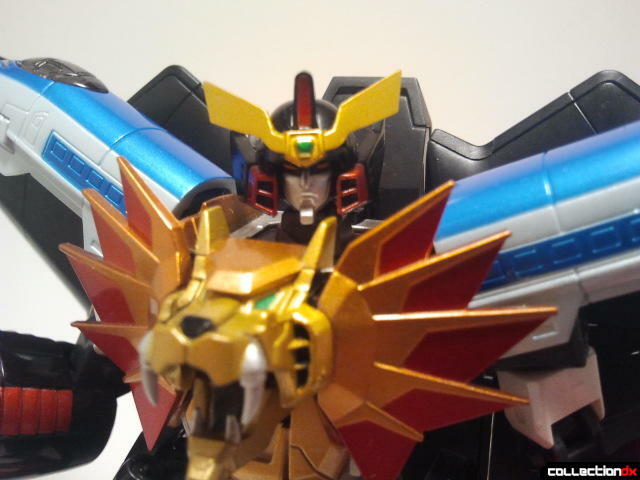 The first accessory is GaoGaiGar's alternate face. Swapping it is easy enough. All you have to do is remove GaoGaiGar's helmet and peg in the alternate piece. 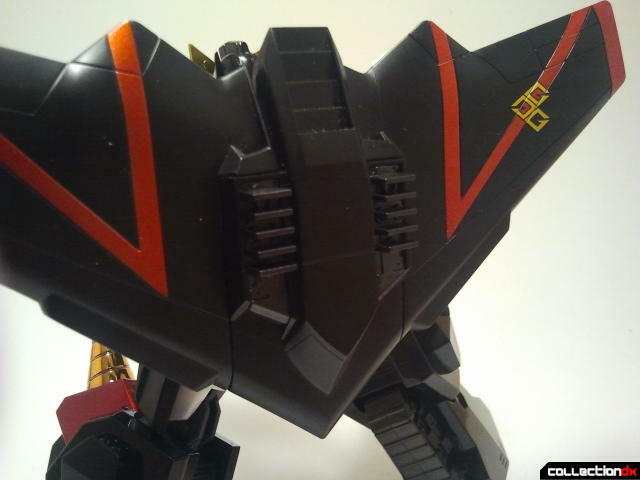 This face represents GaoGaiGar before he puts up his faceplace and is just GaiGar. Of if you're like me, it represents GaoGaiGar after he's had his faceplate smashed off in the heat of the final battle. It was a nice touch that I actually did not expect to get included with this release. 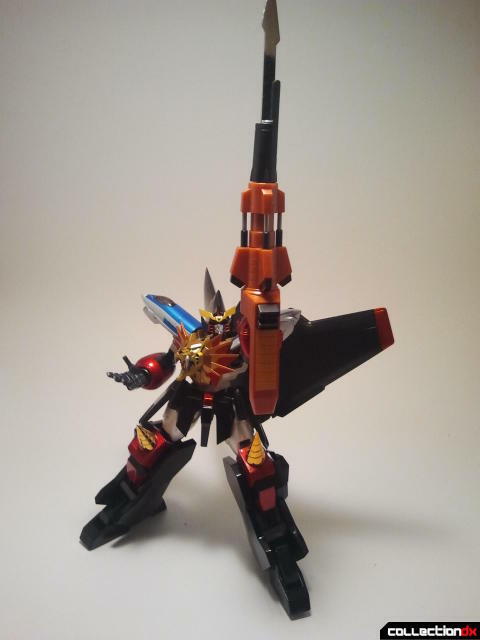 GaoGaiGar also includes a tiny clip to equip him to a stand. Because he's such a heavy toy though, you really need an Act 5 Tamashii Stage stand to support this heavy toy. One of GaoGaiGar's signature moves is his Broken Magnum, where his right fist spins at crazy speeds before he shoots it off as a rocket punch (As all good super robots should.). The piece is meant to mimic when GaoGaiGar's arm is moving incredibly fast. Swapping it onto the arm is a bit of work. The effect part is compose of three parts: two pieces that clam shell over the arm and a top piece that locks everything in place. You need to remove the hand and fit the two shells over the arm before fitting the top piece into the hand peg and locking everything up. It's pretty solid once properly assembled, but the end effect looks just alright. It's hard to capture the motion of an attack that moves so fast and I still commend Bandai on trying to replicate that. Since the arms simply pop off on pegs, you can attach the Broken Magnum part to a Tamashii Stage stand to make it look like it's firing off. Another nice touch. 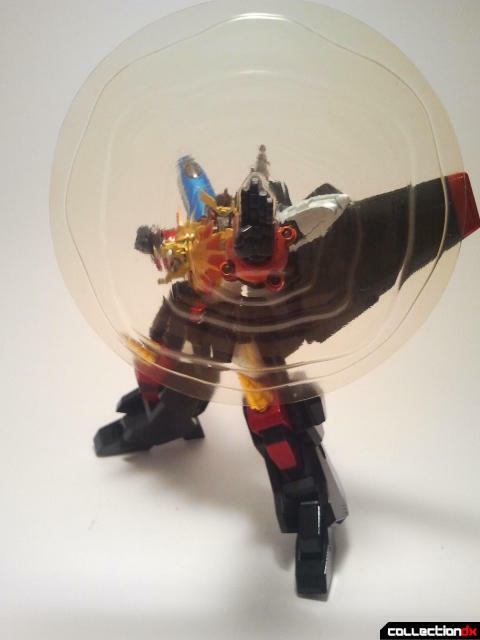 While GaoGaiGar's right hand is capable of Broken Magnum, his left is known for Protect Shade, a defensive weapon that blocks an incoming attack before blasting it back at his enemies. To get the shield look, Bandai included a thin piece of yellow plastic that you fit over the Protect Shade hand. The end result works much better than the Broken Magnum and looks very cool. Especially if you have other robots attacking GaoGaiGar. GaoGaiGar's largest accessory is his Diving Driver. Used to expand time and space to safely fight any enemies, the Diving Driver is an absolutely essential tool in GGG's arsenal. The Dividing Driver uses the same peg hole that the hands do and fits right in. The Driver is so large that I had trouble fitting it into frame without showing the rest of my cardboard light box. The tip of the Dividing Driver is done in a nice shiny chrome and looks fantastic. It doesn't do much, but it does everything that it needs to. Of course GaoGaiGar's most famous move is his finisher: Hell and Heaven!. In order to mimic every single step of this move, Bandai has included hands and parts to make every pose perfect. To start off are his two very distinctly open hands used prepare Hell and Heaven. 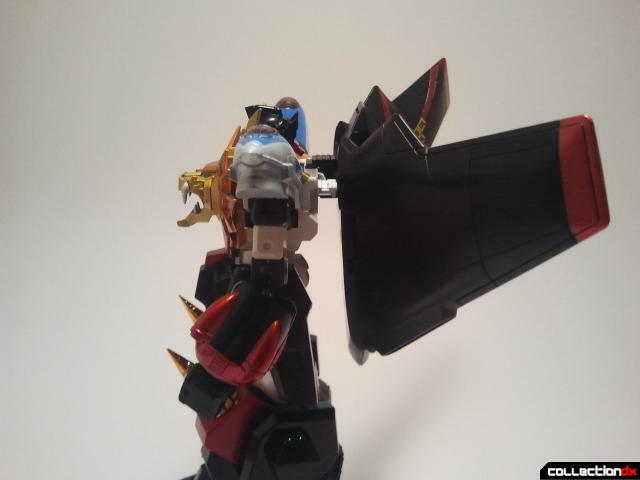 Then his alternate open hands can be used as GaoGaiGar prepares to clasp his hands together. "Gemu... Giru... Gan, Go, Gufo...!" 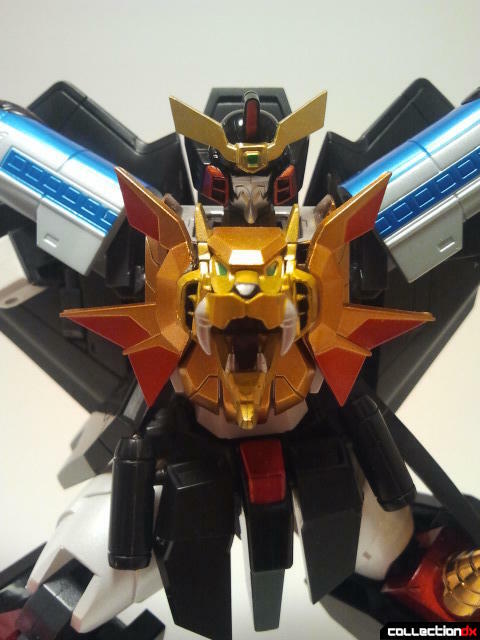 Before you actually clasp his hands together though, swap out Galeon's mane so that you can make sure of the shoulder swivel to get the hands close together without any interference from the rest of the toy. 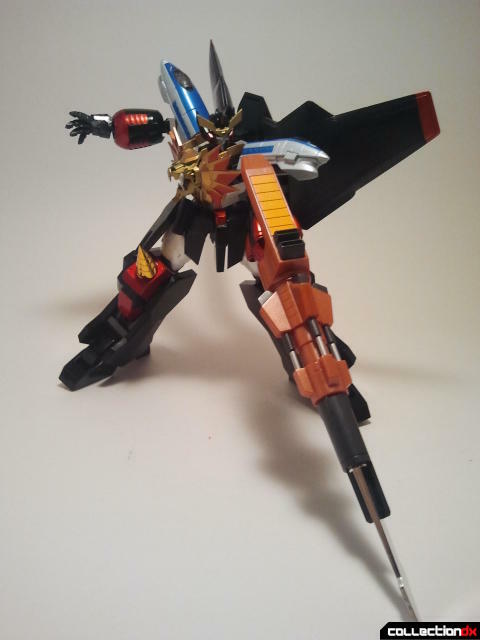 Then use the special Hell and Heaven hands included to get the perfect pose for GaoGaiGar. And on top of that there's one more step! You can swap out the panels on the Stealth Gao to replicate when he thrusts forward. After all of that, you're finally set to emulate Hell and Heaven. Scream it with me, won't you...? To top everything off, a Zonder core is also included for when GaoGaiGar has ripped it out of his enemies. Heck at this point the only thing missing here is a tiny little Mamoru to purify the core along with a random crying pro wrestler, but that might be a little too much to ask for I suppose. 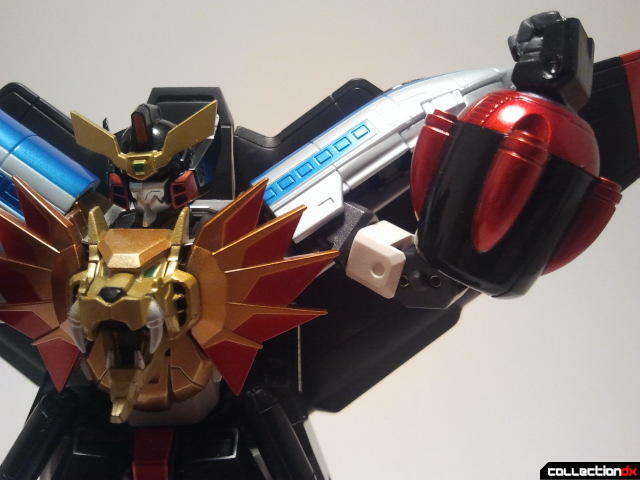 When Bandai first announced that they would be doing the various robots from GaoGaiGar, I was very excited. 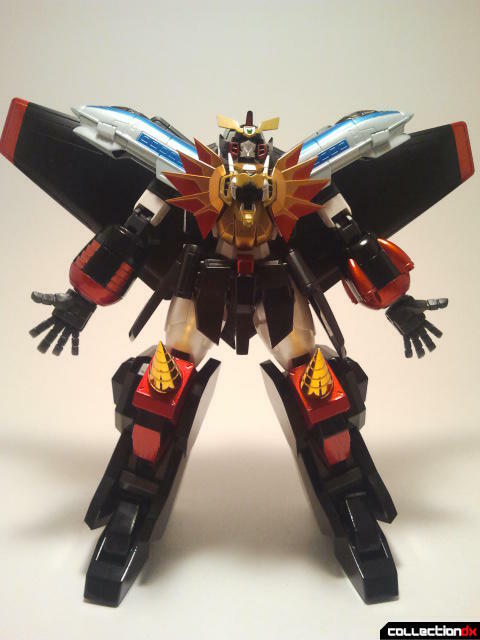 As a huge fan of GaoGaiGar, I always wanted a nice posable version of the King of Braves. However the Max Gokin and CM Corp versions have always been out of my price range and were also riddled with quips and qualms. 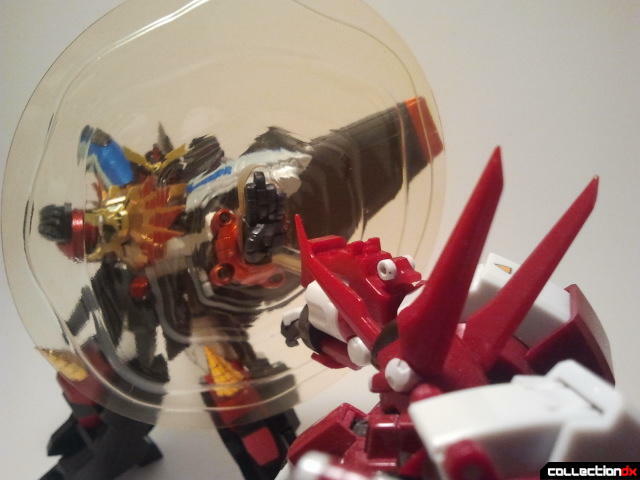 The Super Robot Chogokin GaoGaiGar manages to take care of a lot of those problems. It's definitely not perfect, and a lot of that stems from the actual design itself. However the positives outweigh the negatives so much that I can't help but love this toy. 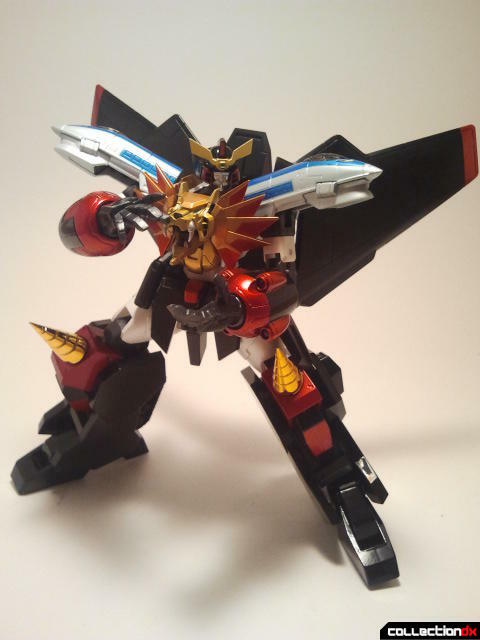 If you are a fan of GaoGaiGar, or even just Japanese robots in general, this is an absolutely iconic design that needs your attention, love, and bravery. Although I can't help but wonder, even for this toy. What happens when Hell and Heaven becomes too much for our hero, Guy Shishioh...? What will we do when it starts killing him...? How did you get the stand to stay up? I have had little luck with mine on heavy figures (like the Robot Spirit Geara Zulu). The stand is the Tamashii Stage Act 5 for mechanics. It's thicker than the stick variant used for the humanoid figures and has a ratcheting joint at the base. The fact that newer figures also come with an adapter clip for it also helps. Did you try to tighten the screws on the stand joints? Yeah. Mine is the Act 5 as well. I tried tightening the joints as well but did not have one to tighten the ratchet screw on the bottom as after tightening the top screws it became the one that wanted to be less stable. I will keep fidgeting with them. Thanks for the response! BTW. Fantastic review. I was not so sure about getting this figure but after reading this review I not only want it I NEED IT! great robot from a great super robot show that is right up there with gurren lagaan and getter robo: armaggedon and gunbuster (though yes, as josh said in the cdx show, targeted more for kids), but should we really have to accept a toy that does not transform & combine when the core element of the show is this feature? Great robot! Great review. I may be branded a heretic, but I think I actually prefer the SRC GGG over the SOC. He just feels more solid and playable. More believable. (plus he doesn't take up more square footage than the dog in my office). And yeah I don't know how you are managing to get this guy airborne? Maybe for a photograph, but I can't see safely displaying him unless his feet are solidly on the ground.